Eko International Corp (EKNL) became the latest xtremepicks.com (Jacob Elatrash) stock promotion on September 25, 2012. Since September 25, 2012 the stock has risen in price from $.04/share to an all-time high of $.78/share on Friday. The entire promotion has been driven by false and misleading statements put out by both the promoter and his good buddy, the CEO of EKNL, but I will go into more details about that later in this report. First I want to talk about how EKNL is in many ways just a repeat of an earlier pump&dump run by the same promoter and the same CEO called Bryn Resources Inc (BRYN). BRYN was once an SEC reporting company registered in Colorado called RnetHealth Inc. The RnetHealth Inc got abandoned in 2001. The last SEC filing done by RnetHealth Inc was an 8K on October 19, 2001 announcing to shareholders that the business entity was broke and was filing for Chapter 11 Bankruptcy protection. On October 1, 2002, the state of Colorado dissolved the entity because it hadn't filed its two previous annual reports and was delinquent in its taxes. This is where the SEC dropped the ball. the RnetHealth Inc shell should have been revoked for not doing any required SEC filings and not keeping its business license current. Instead the SEC let the RnetHealth Inc shell continue to trade over the next 7 years leaving the door open for anybody to come in and hijack the shell and that is exactly what happened. Robert Stevens came in and hijacked the RnetHealth Inc shell. Robert Stevens has a long history of hijacking abandoned shells including the VLNX shell (see our VLNX report) then passing them on to crooked people to use for pump&dump schemes. The reason why these hijacked shells usually end up in the hands of crooked people is because honest people wanting to run a legitimate business look for clean shells to purchase even though the price is usually higher. Robert Stevens can be linked to such companies as Hoss Capital LLC, Technology Partners LLC, and SHC Capital LLC and is a former officer and very large shareholder in Marine Exploration Inc (MEXP). Robert Stevens also runs a transfer agency called X-Clearing Corp located in Denver, Colorado together with his wife, Jodi K Stevens. X-Clearing Corp is a wholly owned subsidiary of Fincor Inc (FINC). Here is their website. Here is a list of publicly traded companies they currently service. Jodi K Stevens is currently the CEO of Forever Valuable Collectibles (FVBC). Robert Stevens originally came in and hijacked the RnetHealth Inc with his partner, Paul Enright (Hoss Capital LLC, Technology Partners LLC, Marine Exploration Inc) on March 31, 2005. Here is a great article about MEXP that mentions Stevens, Enright, and many of their entities. Funny that the transfer agent for MEXP was Steven's, X-Clearing Corp and they had a controversy with a promoter that was paid in shares. For whatever reason (maybe they couldn't find a buyer for the shell) they let the shell go delinquent again and once again get dissolved by the state of Colorado. On January 11, 2008, Stevens and Enright returned to once again reinstate the dead shell. This time they would end up finding a buyer = Rocco DiBenedetto. 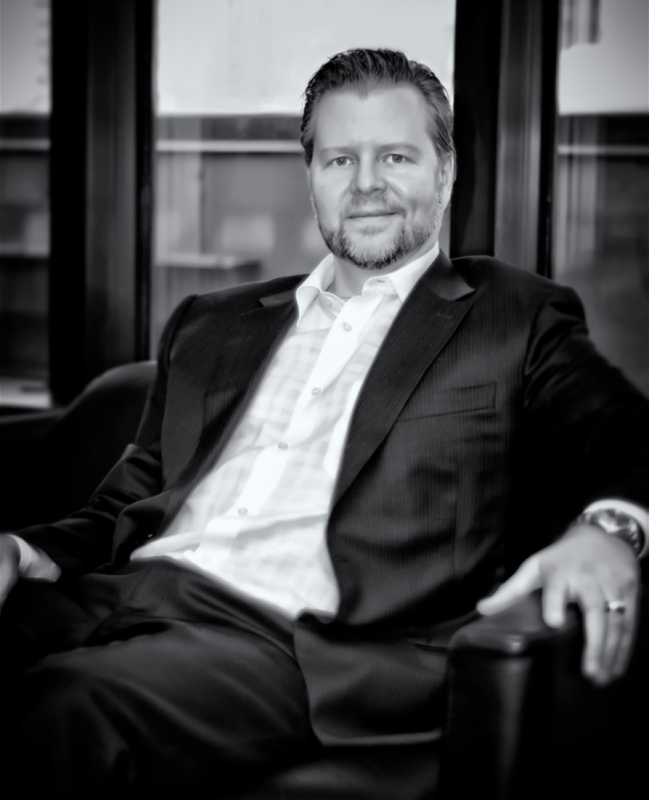 Paul Enright is also a Director for Sierra Resource Group Inc (SIRG). If you find Paul Enright's name attached to a Colorado entity that had once gotten dissolved, but is still publicly traded you can pretty much bet that he and Robert Stevens hijacked the abandoned shell and it will probably get passed off to be used for a dirty pump&dump in the future. This time after hijacking the shell, Robert Stevens and Paul Enright were able to find a buyer for the shell, Rocco DiBenedetto. On February 11, 2008, Robert Stevens filed a form 15 voluntarily terminating the registration of the RnetHealth stock so that the shell wouldn't have to report to the SEC any more. Technically this was grounds for a suspension since you aren't allowed to terminate registration of your stock unless you are current with your SEC filings, but the SEC dropped the ball again. Now with the shell hiding on the non-regulated OTC, Rocco DiBenedetto would have any easier time executing his pump&dump scheme. Enter Diane Dalmy. On November 25, 2008, Diane Dalmy did a filing with the Colorado SOS changing the name of the entity from RnetHealth Inc to Bryn Resources Inc and raising the authorized share count to 100,000,000. Four months later in early April of 2009, Dalmy would file to raise the authorized share count again to 250,000,000. Diane Dalmy is a banned SEC attorney that can be linked to several scam companies and several dirty penny stock individuals. On November 25, 2008, BRYN did a 1:20 reverse split to wipe out all the previous shareholders so that the new owners of the shell could increase the value of their future holdings. You can't have a share selling scheme without first issuing shares to sell. When a company dissolves and ceases all business operations everything disappears. That includes all assets and all liabilities. When Rocco DiBenedetto started doing his OTC filings disclosing the financial state of the company he listed no assets, but he fraudulently included $665,608 in liabilities that since they were listed as existing in 2007 would have carried over from previous management team that abandoned the shell removing all business operations. The transfer agent at this time was X-Clearing Corp (X-Pedited Transfer Corp) which is run by Robert Stevens (same person that hijacked the shell). Robert Stevens and Rocco DiBenedetto collaborated together to turn those $665,608 of fake liabilities into free trading stock. Despite no convertible debentures being listed on the books for the annual report ending December 31, 2008. Stevens and DiBenedetto converted $24,750 of those liabilities into 24,750,000 free trading shares of BRYN stock (a conversion rate of $.001/share). On December 31, 2008, the stock was trading at $.85/share making those $24,750 of liabilities worth $21,037,500. Quite the deal for whoever was assigned a portion of the debt. At this point my guess is that some of those 24,750,000 shares went to Robert Stevens as his payment for the shell. I wouldn't be surprised if some of the money made from the sale of those shares made it back to Rocco DiBenetto. Since Robert Stevens also ran the transfer agency, getting the legends removed to make those shares free trading was surly not an issue. The other big share issuance came just one day prior to that fake debt conversion. On December 30, 2008, Rocco DiBenedetto issued 80,000,000 shares for 50% interest in a mining property located in east central Nevada called 72BLM. As part of the agreement, BRYN had to pay $350,000 to Development Resources LLC (Lee Eastman) within 150 business days or the agreement would be terminated. BRYN never came up with the $350,000 and eventually on February 11, 2010, the agreement got cancelled. Development Resources LLC (Lee Eastman) ended up showing up recently in a Nevada Gold Corp (NVGC) filing. See our NVGC research report here. Before the 1:20 reverse split there were allegedly 51,981,161 shares outstanding. After the 1:20 reverse split there were 2,559,068 shares outstanding. After the issuance of 24,750,000 shares for the made up debt conversion and the issuance of 80,000,000 shares for the signing of the 50% mineral claim purchase that made the outstanding share count on December 31, 2008 107,349,098 shares with 25,159,619 shares free trading. This is confirmed by the initial company disclosure and information statement filed on January 9, 2009. In November of 2009, BRYN signed another mineral claim agreement. This time with Dominic Gingas for 60% interest in group of claims located in Quebec. BRYN issued 85,000,000 shares for the 60% interest. At this point the stock was trading at $.10/share making those shares worth $8,500,000. In December of 2009, the previous agreement made with Lee Eastman got cancelled and those 80,000,000 shares were returned to the company treasury. In March of 2010, another agreement was done this time with 2185920 Ontario Inc (Joe Anfuso), for 100% interest in some claims located in Nova Scotia in exchange for 1,000,000 shares. The agreement was not put into writing until November of 2010. Here is the agreement here and here. The share count now stood at 113,349,098 shares outstanding with 25,159,619 free trading shares. On November 6, 2009, right at the end of the trading day, PennyStockChaser (Dan Ryan) made BRYN their official pick. At this point a good number of those 24,750,000 shares issued for debt way back in December of 2008 still remained unsold. There just wasn't enough volume to have absorbed all of those shares over the 22 months since that time. The BRYN stock price started at $.06/share when the promotion began. With the help of PennyStockChaser, BRYN stock rose all the way to $.87/share 13 trading days later on November 25, 2009. The volume remained pretty high for a few days after the November 25, 2010, but the price kept dropping and dropping until volume dried up and interest in the stock disappeared. By February of 2010, the stock price had dropped to $.11/share. That made the news about the acquisition of the Quebec claims on November 27, 2012 perfectly timed with the main dumping of BRYN stock. Tag Teaming the promotion with PennyStockChaser was xtremepicks which is run by Jacob Elatrash (who is from the same area of Canada as Dan Ryan). Xtremepicks.com made BRYN their pick at the same time as PennyStockChasers. On June 29, 2010, the SEC shut down PennyStockChaser and charged Dan Ryan and Carol McKeown with scalping (receiving shares for payment then touting the stocks in which they own shares without disclosing their share ownership while dumping shares into the market). The Complaint against Ryan and McKeown can be found here. Even prior to xtremepicks and pennystockchasers running a paid promotion on the BRYN stock, xtremepicks was hired to be the Investor Relations firm for BRYN way back in April of 2009. That means that Jacob Elatrash has had a working relationship with Rocco DiBenedetto since at least April of 2009. Back around this time Dan Ryan was still working closely with some other stock promoters from Canada including Alex Barta, Eric Van Nguyen, and a promoter from Wisconsin called Dale Baeten. This group ran a different gold mining scam in 2007 called ABV Gold Inc (ABVG). Probably no coincidence that Diane Dalmy was involved in the ABVG shell too. In 2008, Eric Van Nguyen was running a penny stock promotion site called XplosiveStocks. More information about the connections between this group found here. Eric Van Nguyen (XplosiveStocks) was posting posting on the BRYN IHUB forum starting way back in December of 2008 through March of 2009. In some of his posts, Eric even seemed to have knowledge of what was coming before anything was made public making me wonder if Rocco DiBenedetto didn't purchase the BRYN shell with a relationship already in place with some of these Canadian promoters. After Diane Dalmy was banned by the SEC, Aaron Goldberg became the new legal counsel for the BRYN shell. More information about Aaron Goldberg can be found in our SDIR report. In July of 2010 $141,688 of debt was converted into 1,416,880 shares of BRYN stock. The stock went pretty quiet over the next year. Several days would go by with no IHUB posts and on some days no shares even traded. The stock price continued to slowly drop to $.042/share by July 20, 2011. Exactly 1 year after that July 2010 debt conversion, on July 21, 2011, a new pump&dump begain on BRYN. Xtremepicks was called back in to run a new promotion on the stock. The owner of those 1,416,880 shares was probably wanting to dump those shares at higher prices. It is probably just a coincidence that this BRYN promotion started at exactly the same price as the current EKNL promotion. The stock price rose to $.27/share on day 1 of the promo, but that would be the highest the stock price would reach. In September of 2011, 63,500,000 of the restricted shares issued for the Quebec mining claims were allegedly cancelled reducing the outstanding share count to 51,266,260. In November of 2011, Paul Diana stopped acting as the puppet CEO for Rocco DiBenedetto resigning from all of his officer/director positions. BRYN never did any more filings after that. The OTC website now lists Rocco DiBenedetto as the sole officer/director of the BRYN shell which is fitting since he was the one controlling the shell all along. No progress was ever made with the mining claims, but that should be no surprise since they probably only existed for promotional purposes. Xtremepicks finally stopped trying to push BRYN in March of 2012. BRYN is now a dead stock again. No new disclosure had been made by the company in nearly a year. No new press releases have been published since October of 2011. The stock price has dropped to $.017/share and on some days doesn't even have any volume. Some day BRYN may get pumped&dumped again, but BRYN will never be a real company with any real mining operations. Now that you are familiar with BRYN understanding what is going on with EKNL will be much easier to follow and understand. EKNL is another shell controlled by Rocco DiBenedetto and promoted by xtremepicks.com (Jacob Elatrash). Prior to becoming Eko International Corp, the shell was known as Tomorow's Morning Inc (a California business entity). Tomorrow's Morning Inc was abandoned by its officers/directors in 2001 (just like what happened with the BRYN shell). The SEC dropped the ball with the EKNL shell like they have with hundreds of other shells. EKNL should have been revoked once it was abandoned, but instead the SEC allowed the stock to continue to trade for 6 more years, then in 2007, Michael Anthony hijacked the EKNL shell. Michael Anthony hijacked control of the Tomorrow's Morning Inc shell bringing it back into good standing with the state of California on February 27, 2007. At this time there were 6,247,236 shares outstanding. Michael Anthony found a buyer for the shell right away in Rocco DiBenedetto. On May 24, 2007, Michael Anthony incorporated a business entity in Delaware by the same exact name (Tomorrow's Morning Inc). On June 6, 2007, Michael Anthony merged the California entity out of California and in to the new business entity that he set up in Delaware by the same name, Tomorrow's Morning Inc.
As explained in this excellent article about shell hijackings, switching states is a very common move by the hijacker to cover their trail. With the issuance of 240,000,000 to the shareholders of Tomorrow's Morning Inc - Delaware (Rocco and his family and friends) that brought the outstanding share count to 246,247,236 shares. Like Robert Stevens, Michael Anthony has a pretty long history of shell hijackings including CNWI which was named in SEC litigation and the 29 shells found on this IHUB forum. Anthony's wife, Laura Anthony is an SEC attorney associated with dozens of public shells. Michael Anthony usually followed the same game plan of always quickly moving the shells he hijacked from their original states to Delaware. Unlike with BRYN that had the dirty liabilities added to the books, the EKNL hijacked shell came with no assets and no liabilities as should be expected. The original attorney hired by Rocco DiBenedetto was the same attorney he used with BRYN, banned attorney Diane Dalmy. On December 13, 2007, Rocco DiBenedetto raised the authorized share count from 250,000,000 to 1,000,000,000. On April 7, 2008, Rocco DiBenedetto filed a Form 15 to voluntarily terminate the registration of the Tomorrow's Morning Inc stock making Tomorrow's Morning Inc a non-SEC reporting company so that it could hide from the SEC by only doing unregulated OTC filings. Once again the SEC dropped the ball by allowing this to happen since you aren't allowed to terminate registration of your stock unless you are current with your SEC filings. In April of 2008, the name of the shell was change to Eko International Inc. The cost for all of that was $900,000 (Canadian) that EKNL did not have and 6,000,000 shares. The vendors, Michael MacKay and Irvon Weber were hired as consultants by EKNL. This agreement would later disappear off the books. Apparently the deal never closed and the cancellation of the agreement was never disclosed to shareholders. On August 26, 2008, EKNL acquired Brevina Tool & Die Ltd for $669,403 that EKNL didn't have. As part of this agreement EKNL assumed control of 3 debt Notes for $97,087, $208,738, and $364,078. The $208,738 Note was turned into a convertible debt Note convertible into shares at $.005/share and was immediately converted into 43,000,000 free trading shares of EKNL stock. At this time EKNL was trading at $.05/share making those 43,000,000 free trading shares worth $2,150,000 - far more than the $208,738 they were issued to cover. The $364,078 Note was to be paid back from future revenues earned. The Brevina Tool & Die Ltd acquisition was an arms length purchase since Brevina Tool & Die Ltd was an Ontario business entity controlled by one of the original EKNL shareholders from the Delaware merger, Slobodan Nikolic (see the chart earlier in the post - Brevina even shares the same address that Nikolic used to hold his 15,000,000 shares). That sort of makes you wonder how legitimate those debt Notes were and who actually got those 43,000,000 free trading shares from the first debt Note conversion. In September of 2008, 1,000,000 shares were issued in a private placement at $.05/share raising $20,000. During the last quarter of 2008, 2,782,994 shares were issued in a private placement at $.10/share raising $278,299. For the year ending December 31, 2008, EKNL did however manage to earn $8,237 from sales, but lost $1,020,974 after subtracting away operational costs. In order to make all of the 2008 acquisitions, EKNL had to borrow a lot of money. By the end of 2008, EKNL had $1,526,634 in liabilities. In March of 2009, EKNL made yet another acquisition with money it didn't have. EKNL acquired Niagara Industrial Finishes Inc for $250,000, 6,000,000 shares, and $1,000,000 in future revenues. The share count now sat at 299,120,230. I couldn't find any major promotions done on EKNL during the later part of 2008 or first half of 2009, but I'm sure that insiders managed to sell off those 43,000,000 free trading shares from the arms length debt Note conversion forcing down the EKNL share price. In June 25, 2010, EKNL executed a 1:300 reverse split wiping out all the previous shareholders allowing the shell to start over fresh again with a new higher share price of $.20/share. The new outstanding share count was now 997,734. On July 21, 2009, EKNL in by far the dirtiest move to date, converted $120,000 of debt into 60,000,000 free trading shares. That was a conversion rate of $.002/share at a time when EKNL was trading at $.20/share. $120,000 in insider owned debt converted into $12,000,000 worth of stock immediately following a 1:300 reverse split before the D was even dropped. Sickening. On July 24, 2009, EKNL announced that it had issued 140,000,000 shares for the acquisition of an anonymous business entity called 2211259 Ontario Inc that had allegedly developed a proprietary method of making it possible for commercial and industrial tenants to participate in the capital appreciation of the properties they occupy. The company has also developed a financing structure that allows for an accelerated rate of growth in the acquisition, development and building of properties. This agreement was rescinded and the 140,000,000 shares cancelled on November 12, 2009. By November of 2009, the liabilities/debts had grown to almost $2.5 million including $1.7 million classified as loans. On November 10, 2009, those $1.7 million in loans were converted into 170,000,000 common shares ($.01/share). This was another exceptional deal for the insiders since the stock was trading at $.043/share on November 10, 2009. EKNL was now a stock with 230,997,734 shares of stock, 230,000,000 of which were owned by insiders through extremely discounted debt conversions. Since only 6,460,097 shares trading (mostly consisting of small even blocks) before November 10, 2009 that means that nearly the entire 60,000,000 free trading shares were still being held by insiders when the new 170,000,000 free trading shares were issued. No new news came out from EKNL between November of 2009 and January of 2012. Between November 10, 2009 and November 28, 2011 only 19,168 shares traded. During this time, EKNL replaced banned attorney, Diane Dalmy, with the same attorney Rocco DiBenedetto uses with BRYN, Aaron Goldberg. The 2010 annual report shows us that during 2010 all previous business operations basically ceased to exist. All the assets but some equipment disappeared. All the revenues stopped. EKNL had gone back to being little more than a shell company. What happened is that on December 3, 2010, EKNL split off its subsidiaries. A new Canadian Controlled Private Corporation was formed. EKNL spun off all of its active business operations into this private entity and shareholders owning 218,240,925 shares agreed to exchange their EKNL shares for an equal amount of shares in the new entity. EKNL tells us who owned 138,987,610 of the 218,240,925 shares, but EKNL never discloses who owned the other 79,253,315 shares. I'd be willing to bet that Slobodan Nikolic and/or Rocky DiBenedetto probably owned a large majority (if not all) of the other 79,253,315 shares. This reduced the EKNL outstanding share count to 12,756,746. EKNL discloses who owned most of those remaining shares. 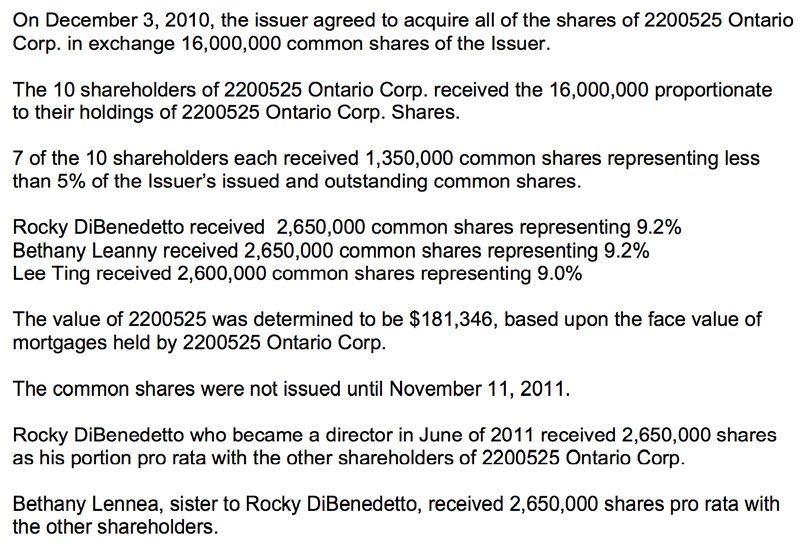 On the same day, December 3, 2010, EKNL purchased a private entity called 2200626 Ontario Corp for 16,000,000 shares. Those shares would not end up getting issued until November 1, 2011. This made 2200626 Ontario Corp EKNL's only subsidiary. This also made the new EKNL outstanding share count 28,756,809. The float was now 10,153,136. The other 7 shareholders each received 1,350,000 shares keeping their ownership under 5% so that their names would not have to be disclosed in the filings. Funny thing is that if you do that math those numbers actually total 17,350,000 not 16,000,000. The $181,346 in assets associated with 2200525 Ontario Corp seems to be associated with a business lot that is in the name of the entity valued at $143,000 and a mortgage of $38,000 associated with another business lot. With the EKNL share price trading at $.07/share at the time of the acquisition, those 16,000,000 shares were worth $1,120,000 for those $181,346 in assets. If it was 17,350,000 shares then that was $1,214,500 worth of shares for $181,346 in assets. Following the spinoff and arms length agreement to purchase a family owned entity, the new share count looked like this (according to the filings). Between November 28, 2011 and December 31, 2012 volume picked up some, but only 1,596,368 shares total traded during that time. Maybe this was some kind of insider action as they were preparing to bring the shell back to life. There was a mini IHUB pump run on the stock in mid-January that coincided with the first news release by ENKL in well over 2 years (about the possible acquisition of an anonymous entity) pushing the stock price up from $.07/share to $.33/share on light volume showing how thin the stock was as nearly all shares were still insider owned. After losing an appeal, 2,926,291 shares were issued to Clear Path Securities LLC by court order on April 17, 2012. Apparently as part of the spin off agreement, EKNL cancelled 5,000,000 shares owned by John Formicola that were being held by Clear Path Capital LLC without presenting the TA with the stock certificates to legally cancel the shares. Because the stock certificates were never presented those 5,000,000 shares continued to be held in an account at Clear Path Capital LLC. John Formicola then put in an order with his brokerage, Clear Path Securities LLC, to sell 2,926,291 shares which Clear Path Securities LLC executed. Because those share were illegally sold, Clear Path Securities LLC filed a law suit which they won. EKLN was forced to re-issue 2,926,291 shares to Clear Path Securities LLC. This brought the outstanding share count to 31,683,037 and the float to 13,079,427. Clear Path Securities LLC is still seeking attorney fees and other monetary damages. That part of the lawsuit is still pending and is scheduled to go to trial unless a settlement is reached first. A name was given to the acquisition target from the January press release. OeBin Ltd. Website found here. OeBin Ltd is a company that sells construction equipment, used trucks, and commercial equipment. OeBin Ltd is an Ontario business entity controlled by Ali Mohsen that allegedly plans on opening an office in Gambia, Africa some time in November of 2012. To date there has been no disclosure that this acquisition yet to be executed. I don't think that OeBin Ltd ever will be acquired which is why EKNL stopped hinting at the possibility of ever acquiring OeBin Ltd a long time ago. On July 24, 2012, EKNL entered into a joint venture agreement with NeuroVasc Clinic Inc (an entity controlled by Dr. Paul Ziemer) to form a new entity called NeuroVasc Medical Inc which would be used to distribute a device known as FREMS (Frequency Rhythmic Electrical Modulation System). The joint venture entity, NeuroVasc Medical Inc, is 51% owned by NeuroVasc Clinic Inc and 49% owned by EKNL. The FREMS device is manufactured by Lorenz Biotech S.p.A. of Modena, Italy and supplied by Lorenz Neurovasc Inc who is a company in Canada. What is unclear is if EKNL through its joint venture entity, NeuroVasc Medical Inc, purchases the FREMS device from Lorenz Neurovasc Inc then resells it or if NeuroVasc Medical Inc works for Lorenz Neurovasc Inc as a distributor of the device in the US. All indications seem to point to EKNL being a reseller since there is no mention of NeuroVasc Medical Inc on the Lorenz Neurovasc Inc website. All the same I have an inquiry in to Lorenz Neurovasc to see what I can learn. What is clear is that as a distributor/resaler only, EKNL does not own or manufacture the FREMS device and does not benefit by the success of the device beyond the actual sales that EKNL is involved with. Dr. Paul Ziemer, who has been added as a director of EKNL, breaks down the joint venture arrangement more clearly in his radio interview found here. Paul Ziemer explains that NeuroVasc Clinics Inc's 51% will involve supplying the equipment to medical centers and then educating the medical centers that purchase the equipment on how to use it. EKNL's 49% will involve providing financing and infrastructure (ie the transportation and workers needed for shipping). According to EKNL, the sale of each FREMS device will equate to $8000 in profits for EKNL. In a September 27, 2012 press release, EKNL announced that two months after the formation of their joint venture agreement, NeuroVasc Clinics Inc got its first commitment. The Mayer Institute in Hamilton, Ontario (Dr. Perry Mayer) has allegedly committed to the purchase of the FREMS device upon the completion of their would treatment center which is currently under construction. EKNL anticipates that the Mayer Center will have use for 5 FREMS devices when construction of their new wound treatment center is completed. EKNL says the construction of the clinic should be complete by the end of October and promises an update at that time. Dr. Paul Ziemer has worked with the Mayer Institute in the past. To date this is the only actual sale announced by EKNL and it still remains only agreement in principal. The actual sale has not been executed. To meet their commitment to provide the infrastructure, EKNL has Oebin Ltd on stand by to be used for distribution needs in Florida and New York, but since FREMS sales aren't exactly soaring I don't see any trucks needed for transportation any time soon, if ever. Going into the agreement, as of June 30, 2012, EKNL had not even a penny in cash so how they are going to manage financing this joint venture is a mystery. Apparently it will be done through the issuance of shares. On September 25, 2012, EKNL announced that it would be issuing 1,000,000 shares to EuroVasc Medical Inc to meet its obligation to the joint venture. The stock got really quiet again through the summer of 2012. As the volume dried up to nothing on some days the stock price fell back down to $.04/share by September 24, 2012. "Since Xtremepicks.com receives compensation and its employees or members of their families may hold stock in the profiled companies, there is an inherent conflict of interest in Xtremepicks.com statements and opinions and such statements and opinions cannot be considered independent. Xtremepicks.com and its management may benefit from any increase in the share prices of the profiled companies." "With an active float of only 5.5 Million shares and insiders not selling a single share, share inventory continues to dry up super quick"
That is false. EKNL has disclosed in their filings (latest one was filed September 4, 2012) that the float is 13,079,427. Since then EKNL has claimed the float is 8,079,427 in press releases. "EKNL with Walmart on board now"
Xtremepicks has been continuously throwing out Walmart to pump the EKNL stock price. This is false. EKNL has absolutely nothing to do with Walmart. The way that Jacob Elatrash spins this lie is because Dr. Paul Ziemer through his other entity, NeuroVasc Clinics Inc, of which EKNL has absolutely no ownership, has an agreement with another publicly traded company, Neurometrix (NASDAQ:NURO), to help distribute the NC-Stat DPN check device which just so happens to be available in Walmart stores. The only way that the distribution of the NC-Stat DPN check device is even remotely beneficial to EKNL is because the NC-Stat DPN check device is used to help detect diabetes. And it is people with diabetes that could potentially end up being a patient at a clinic that my end up purchasing a FREMS device from NueroVasc Medical Inc some day. "you have EKNL working closely with a large cap Nasdaq board company (NURO) and top professionals in the industry, rarely heard of for and OTC company this early on in their business development"
Again false. EKNL is not working closely with NURO. EKNL has absolutely no affiliation with NURO. Just because the new director, Dr. Paul Ziemer has an affliation with NURO through his entity, NeuroVasc Clinics Inc of which EKNL has absolutely no ownership in does not make EKNL a partner of NURO. Pure rubbish. "EKNL also announced a reduction in authorized shares amount limit to 75 Million and will be buying back shares in the open market with proceeds received from their FREMS technology!" To date EKNL still has not filed the amendment to reduce their authorized shares from 1,000,000,000 to 75,000,000 despite making the announcement in an October 15th press release. The process is extremely simple. You fill out a form and turn it in to the Colorado SOS. In that press release, EKNL did not say that they would be buying back shares with proceeds from FREMS sales. EKNL said upon the achievement of becoming cash positive and the repayment of all liabilities, EKNL intends on initiating a share buyback. EKNL has never been cash positive ever. Even when EKNL was allegedly doing over $1,000,000 in revenues in 2009 they still managed to accumulate liabilities in excess of $2 million because of operational costs. Since EKNL has yet to sell a single FREMS device through 3 months of marketing and only has a commitment for a future sale of no more than 5 devices to date do not count on EKNL ever achieving a share buyback. "EKNL launched first of many Clinics [the Mayer Institute] starting to treat patients with their FDA approved FREMS technology"
This statement isn't even a spin. It is just a flat out lie. EKNL didn't launch the new Mayer Clinic. EKNL has nothing to do with the construction of the Mayer Institute's new clinic for wound treatment. EKNL only has a potential future sale with the Mayer Institute. "EKNL will be attending the 13th annual Medical Show in London starts tomorrow and Saturday, expect some HUGE contracts to come out of this show and HUGE press releases to take us to $2.00+ level"
First of all price target = illegal. Second, it was London, Ontario. Third, EKNL's director Dr. Paul Ziemer was not at the show pushing the FREMS device. If Dr. Paul Ziemer was at the show, he was only at the show through his affiliation with Neurometrix (NASDAQ:NURO). Dr. Kenneth J. Snow did a lecture at 1:00 in Salon D on Friday, October 26th about type 2 diabetes. Dr. Snow and Dr Ziemer did a lecture together on Saturday, Oct. 27th in Salon C at 3:45, but this one was about the NC-Stat DPN check device. He did the lecture as a representative of Neurometrix. This lecture had nothing to do with the FREMS device or EKNL. Neurometrix was one of the exhibitors at the show demonstrating their NC-Stat DPN check device which has nothing to do with EKNL. Don't believe me. Just check out the Conference Agenda Brochure linked right here which includes a list of Exhibitors at the end. NeuroVasc Clinic Inc is not on that list. Let me repeat. EKNL has absolutely nothing to do with Neurometrix. As far as I know EKNL has never claimed to have anything to do with Neurometrix. The misleading statements about EKNL and Neurometrix are all coming from Jacob Elatrash. In this case though the misleading statement about the FREMS device being demonstrated at the conference came from EKNL in this press release. "EKNL is in process for uplisting to higher exchange like NASDAQ – HUGE!" Another lie made up by Jacob Elatrash. EKNL has never mentioned uplisting and for good reason. EKNL doesn't come close to qualifying for an uplisting to the NASDAQ - not even remotely close. Even if EKNL were to hit the illegal price target price of $2.00/share they would still not even be remotely close to qualifying. Qualifications include millions of dollars in assets and millions of dollars in revenues. Learn more here. There have been dozens of other lies/misleading statements made by Xtremepicks (Jacob Elatrash), but I want to get to other information so I'll just end this section by saying that in my opinion, Jacob Elatrash is about as dirty of a promoter as you'll find, and I won't be surprised to see him show up in SEC litigation some day. Jacob Elatrash is the owner of Xtremepicks. He is from Mississauga Canada not Belize like his newsletters say. In this S-1 filing for Health Advance Inc (HADV) we find Direct Global Media Corp listed as one of the seed shareholder. In the foot notes Jacob Elatrash is listed as the owner of Direct Global Media Corp.
Jacob Elatrash actually does show up as having signed some of the early newsletter/prs for xtremepicks here and here. A private company by the name of Canada Mortgage Investment Corporation (CMIC) is at same address & phone number of EKO International (EKNL) & Bryn Resources (BRYN) - 855 Brant Street, Burlington. According to the Ontario Ministry of Consumer & Business Services – Corporation Profile Reports; Rocco Dibenedetto along with his wife, Rose Ting, and Edgar P. Warkentin were declared as the founding directors of CMIC. The archival website for CMIC states that Rocco Dibenedetto was declared as the Investor Relations contact as well as the Chief Financial Officer. The whole mortgage thing makes me think of the 16,000,000 shares issued for the acquisition of 2200525 Ontario Corp.
Rocco declares no share ownership in BRYN or EKNL yet has been the main puppeteer in these companies. There are several civil judgments against Rocco DiBenedetto (and his current wife Rose Ting) and this may account for why they are not declared shareholders yet manage and control these public company businesses. This may also explain why share are always held in the names of relatives. Civil judgments lead to the seizure of assets which can include money made through share sales or possibly even the shares owned in publicly traded companies. Dibenetto and Ting were found to have received illegal kickbacks from the sales of medical devices in civil court. Richard C. White is also the uncle of Rocky Dibenedetto and brother of Rocco’s estranged wife Lee Dibenedetto (nee White). According to the court records Richard C. White had declared bankruptcy prior to the onset of this litigation. According to the court records Rocco Dibenedetto had misappropriated the life savings of an Italian immigrant (Piccolo) whom he met in his Jehovah’s Witness church on the pretext of investing his life savings in high return mortgages. The money disappeared leaving Piccolo, his wife and handicapped son without any financial resources. Rocco DiBenedetto’s brother (James) and brother-in-law (Richard C. White) were both forced to declare personal bankruptcy at the time of their involvement with public/private company businesses controlled and/or managed by Rocco Dibenedetto. Speaking of James DiBenedetto, he has had his share of issues with the cops having to do with drug busts, but before his recent drug arrest, James was involved in some public companies with his brother, Rocco, that did not go so well (at least from the prospective of the regulators). The British Columbia Securities Commission filed an Order against James J. Dibenedetto in 2000. James was a naive individual in public companies and corporate governance and was acting on behalf of his older brother Rocco Dibenedetto in the operation of this public company (Greenwood Environmental). How much the history of other DiBenedetto business ventures will play into the success or failure of this venture is yet to be determined, but history usually repeats itself in penny stocks. I'm sure that the FREMS device is probably an important device that could do a lot of good for some people with certain health issues. EKNL has had a very nice run over the past month, but make no mistake, EKNL is being pumped using misleading statements and eventually the stock price will hit its peak (maybe already has) and it will come crashing back down. The FREMS distribution business has generated no verifiable revenues to date and with just a commitment for a future purchase the business is showing little promise for the future. The float was very low for a stock trading at $.04/share at the start of the promo at between 8,079,427 and 13,079,427. Most of those shares were insider owned making EKNL an easy stock price to manipulate. Very soon though most of the 16,000,000 shares issued for the acquisition of the DiBenedetto family owned 2200525 Ontario Ltd will become free trading. November 1, 2012 will mark 1 year since those shares were issued. There is also no telling when EKNL will do one of their infamous moves of turning debt into extremely discounted free trading EKNL stock. Already as of June 30, 2012, debts had grown from $16 at the start of the year to $221,808 in just 6 months. Make no mistake. EKNL is just another dirty penny stock having its share price manipulated up through false and misleading statements. At least this promotion has allowed many people to take profits. It is just a matter of time though before the balloon bursts. Don't be one of the ones left holding the bag. LMAO. I loved reading this piece on Rocco. Rocco was a scam artist from the mid 1990’s when I first unfortunately met him. A tiger never changes his stripes. Everyone that ever comes into contact with him gets burned. Has there been any known recent fraud activity from those above? If so, I would be interested. Thanks! The mining company, (BRYN) Bryn Resources Inc., is continually listed in the daily NYSE. Bloomberg states the it is under the leadership of Paul Diana, although nothing has been reported unto the S.E.C. since 2011 or 2012!